Discussion in 'Microsoft Surface Pro' started by Spaniard, May 31, 2013. I read this on reddit. Is it true? So I was running League of Legends just to figure out the throttling, and, after releasing the frame limiter in LoL (by choosing benchmark framerate options), the CPU goes from 2.4Ghz to 900Mhz once the CPU approaches 80c, which basically makes this and every demanding game unplayable since the CPU can't stay at full speed for a long time. For what it's worth, at the lowest settings on 1920x1080, LoL ran at close to 100fps when the CPU was at 2.4Ghz and regressed to around 30fps when the CPU was throttled. The orange line on the graph represents CPU speed. Notice the big dip. That's when I was fullscreen in LoL. Note how it correlates with the inverse of the CPU temperature line. I like the Surface Pro for everything else it can do but this really was disappointing. I understand that the SPro is capable of playing Steam-type games, but to expect it to perform like a full blown desktop is kind of unrealistic, in my opinion. If I want to play games like LoL, COD, or BF3 for example, I'm not going to expect my Surface to perform like my gaming rig.....that's what my monster desktop is for. To say that it's "disappointing" because you discovered it doesn't play a certain game this is a bit too much. Of all the things that the Pro is capable of doing and finding this one little flaw makes it "disappointing", come on now. I wouldn't even call it a flaw. I love my old junky Jetta but I was disappointed with the car because it cant go 160MPH, even though it has a stock turbo built in. Yeah, well, maybe, but I was disappointed when I discovered that the Pro won't do multiple video conversions as fast as my I7-3820. It has nothing to do with expecting it to perform like a gaming rig. But I can expect that the CPU/GPU perform like they should and that overheating isn't really an issue. Well in your slavish devotion to all things Surface Pro you failed to address the question of the OP, "Why is the Surface Pro throttling during games". The answer to every complaint about the Surface Pro isn't that the user should just shut up and stop complaining. You wouldn't call it a flaw? Who cares what YOU would call it? It isn't about YOU. The OP is disappointed his $1200 machine can't play his games because MS is apparently throttling the CPU at high temps. He has a RIGHT to find that disappointing without being put down by Microsoft sycophants such as yourself. An answer that would actually address the OP without putting them down would be that MS probably throttles the SP above 80C because it simply doesn't have the cooling to make temps above that level safe. Tiny fans and no airspace. In trying to be an ultrabook and tablet at the same time there will be tradeoffs. Sadly limited gaming is one of them. See, you can answer a complaint without insulting someone. It's not hard. UPDATE: Have personally tested this with the Surface Pro. Although it does not prevent throttling above 80c completely, it does seem to keep you above 2.0 Ghz pretty steadily which would be an improvement. I find that if I do anything requiring any power at all I immediately pop up to 2.4+ which is nice. Prior to using Throttlestop I rarely went into Turbo. My Access Database feels a bit faster. 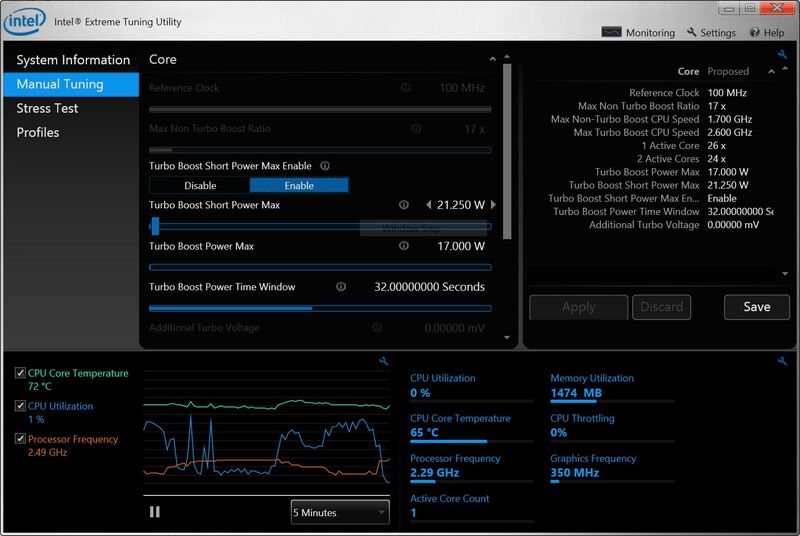 ** One nice feature is that you can enable "Power Saver" which will downclock you to around 1.0 Ghz when you are just sitting idle but pops you right back into Turbo the moment you do anything which I am guessing will make for zippier desktop performance without eating battery all the time. You can set up a "Gaming Profile" which does not have Power Saver enabled. One of the things that is holding you back is the power settings MS has gone with which are actually quite low. Not being expert in these things I don't want to mess with those lest I fry my rig here. Bottom line, I don't think MS is going to let you run your Surface Pro much above 80c period (understandable), but this software does seem to keep you clocked higher overall. Of course proceed at your own risk.